"When I first came to Kentucky, my employer did not have domestic partner benefits, and we couldn't pay all our medical bills. As a lesbian/member of the LGBTQ community, I am proud to belong to an organization that fights for equality for all Kentuckians." As KFTC has grown, expanding our vision of equality for all Kentuckians has been a labor of love and a transformative internal process. While many members shared this vision of equality for decades, in 2004 our Steering Committee shared a series of deeply emotional conversations, meetings, and personal reflections and eventually adopted language to our platform to include our LGBTQ (Lesbian, Gay, Bisexual, Transgendered and Queer or Questioning) communities. Since then (and well before), our local chapters and statewide members have contributed to a growing movement for fairness, safety and celebration of diversity in Kentucky and beyond. 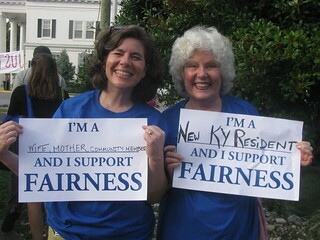 From offering our staff domestic partner benefits to lobbying our elected officials for fairness ordinances and anti-bullying legislation, KFTC members continue to prioritize our vision for a better Kentucky all Kentuckians deserve. As you can read in our blog feed below, our local chapters have recently prioritized LGBTQ equality through Fairness Ordinance organizing in Berea, safe restroom campaign in central Kentucky, creating LGBTQ support networks in Perry County, and much more. What is a Fairness Ordinance: A Fairness Ordinance would prohibit discrimination in the workplace, housing, and public accommodations based on sexual orientation or gender identity. We believe that all Kentuckians have a right to live without fear of unjust discrimination, regardless of their race, religion, sexual orientation, or gender identity. As written, Kentucky law does not guarantee this right, and must be changed. We support a statewide Fairness law and also Fairness ordinances at a local level until a statewide law is establish. Kentucky Gov. Matt Bevin has joined officials from 16 states in urging the U.S. Supreme Court to rule that people who identify as lesbian, gay, bisexual and transgender do not have special protections against discrimination on the job. Join with Kentucky Poor People's Campaign: A National Call for Moral Revival participants from across Kentucky as we sing, speak out and stand together for democracy. Follow the leadership of people impacted by systemic racism, poverty, the war economy, ecological devastation, and the nation's distorted morality as they speak out. The Lexington Pride Festival is an annual event created to celebrate the LGBTQ+ people, their friends, families, and allies. The family-friendly festival is held on the last Saturday of June at the Robert Stephens Courthouse at the corner of North Limestone and Main Streets.